The phrase 'quad-SLI' ought to be enough to give you an idea just how much of a gaming monster Palicomp's latest machine is. With a pair of Gigabyte-branded Nvidia GTX 590s lashed together the Pheonix Inferno Redline is capable of producing the sort of frame rate numbers we've never before seen. Palicomp has gone to great lengths to ensure this is the ultimate gaming machine on the market, and to be fair it comes pretty darned close to being the ultimate machine full stop. It's an insanely over-specced rig. With those twin, multi-GPU graphics cards, a top-end Z68 motherboard, 16GB of speedy DDR3, OCZ's 240GB Vertex 3 and 4TB of standard hard disk storage the overclocked Sandy Bridge CPU is actually the weakest part. That may sound strange calling a Core i7 2600K running at 4.9GHz a weak component but that is the only part of the rig that doesn't count as top of the line. Granted it is the most advanced Core architecture around at the moment, but it's still lacks the core count of its hexcore, X58-based brethren. Chips like the i7 990X come with the full six core count, rocking a full 12 threads of processing power and are able to take advantage of the triple channel memory the X58 platform offers. But there's a trade-off, and that's price. Dropping one of the Gulftown, hexcore CPUs into the equation would have knocked the price up closer to £5,000 and realistically would have given barely noticeable improvements to performance. 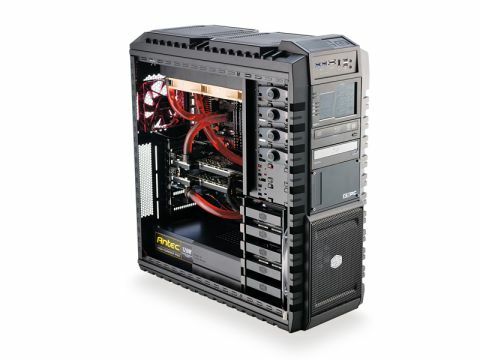 There's also the fact the X58 platform is now practically dead. We ought to see its replacement, Sandy Bridge E, in the next few months sporting an advanced hex-core architecture and access to quad-channel DDR3 memory support. Again though we're talking about crazily-priced, $1,000 CPUs. So while it's not necessarily the highest-spec processor around, the Core i7 2600K is still the chip of choice for any top-end PC build today. The Z68 motherboard sitting inside the Pheonix Inferno Redline ought to be ready and waiting for the next spin of the Core architecture – Ivy Bridge. When that turns up early next year you should be able to drop it into most Z68 boards with little more than a BIOS flash. Importantly, the i7 2600K is the best gaming CPU currently available. It supports the multitude of graphics processors on those twin cards perfectly, freeing them up to really hit the maximum of what they're technology allows. The impressive cooling array set up to look after both those hot ol' graphics cards and the seriously overclocked CPU means that the extreme performance the Pheonix Inferno Redline is capable of doesn't come at the cost of reliability or longevity. Even under continuous full load the CPU rarely gets north of 46°C with the twin graphics cards generally staying well below 60°C. The only slight issue here is the fact that it's a single-loop water-cooling setup, with the CPU getting the cooled liquid first then one graphics card after the other. The result is the graphics cards don't get the full benefit of liquid cooling, with the second card inevitably running noticeably hotter than the first when under full load. Still, running well under worrying temperatures is what this cooling setup is designed for, as well as keeping the chunky CPU overclock in place. And in both those scenarios this serious cooling setup works well.